In this post, I complained about the purple evening gown worn by Admiral Amilyn Holdo in The Last Jedi. Comments were split between agreeing and those saying I shouldn't judge. I could see both sides - it should be about what you do, not what you wear. 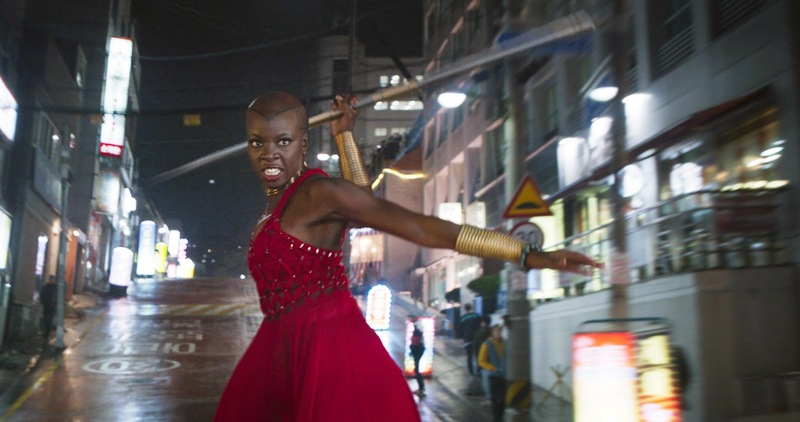 Fast forward to today, and let me introduce you to Okoye, a general in the Dora Milaje, Wakanda's all-female team of fierce warriors (played by Danai Gurira). You will know who I am talking about as soon as you go see Black Panther. IT WAS TOTALLY AWESOME! The story, the acting, the costumes, the cool imaginary tech - everything about it was great. Okoye was one of many strong female characters in the cast. She was my favorite character in a movie brimming with favorite characters. The women really rock in Black Panther.